JAM families are those who are just about managing to make ends meet. The increase in income tax threshold and reduction in taper rate will help them. No, I’m not talking about that lovely stuff you spread on your toast and have for breakfast, together with that steaming cup of coffee. I’m talking about that category of people who are Just About Managing when it comes to their finances. As a payday loan lender, Cashfloat often helps out people who are Just About Managing with online pay day loans – making it easier for them to finish the month with less pressure. As such, the recent changes suggested for those of us who are JAM piqued our interest specifically. What does Just About Managing really mean? You just about manage cover your bills and expenses on a regular month. If an unexpected expense comes up, you’re stuck. You can’t afford luxuries such as holidays and home renovations. You don’t really have any savings – you’re using up all of your income. JAMs describe those people in the bottom half of the income distribution table but above the bottom 10%, who receive no more than one-fifth of their income from means-tested benefits – in other words those in employment but on very low income. This is good news for JAMS… or is it? As most of our online payday loan customers are JAMs, we decided to investigate the truth. Are you among the one million workers who will be receiving a pay rise next April? The National minimum wage for those aged 25 and above is increasing from £7.20 to £7.50. Chancellor Philip Hammond says that, for full-time workers, this increase is worth over £500. So, for those people who are JAM and are earning the minimum wage, this change is very good news indeed. That extra money can go a long way, helping JAM families circumvent the usual end-of-month scramble for cash which is the main cause for people to turn to payday loans. What other announcements were made? Another significant change occurring in April 2017 is that the income tax threshold will be raised from £11,000 to £11,500. Additionally, the taper rate is being lowered to 63%. These changes mean that those on lower income, who need every penny they can get, will be paying less tax on their earnings. Maintaining a car can also work out to be ridiculously expensive, which is why the freeze on fuel duty is also very welcome news for motorists. When you’re only just about managing to make ends meet, every penny saved makes a difference. Now that housing costs in the UK are so high, any action of the government to help the JAM families will have a big impact. Therefore, the recent moves to ban letting agency fees and provide more help for renters are very much appreciated among the renting population. Furthermore, a £1.4 billion investment will be made into building 40,000 affordable new homes. This news has made the struggling sectors of society feel that tangible moves are being taken to ease their situation – good news indeed for those who are hard-pressed to pay their rent or mortgage each month without resorting to unsustainable borrowing such as short or long term loans online. The announcement of an increase in Insurance Premium Tax (from 10% to 12%) will have a large impact on the population. Essential insurance such as car and home insurance will now become even more expensive, which could have the effect of forcing customers to lower their level of cover in order to still be able to afford the fees. This may not be a wise move, however, as should something happen that is no longer covered by their insurance, they will have to cover the costs themselves. As we are talking about low income families, this could be the straw that breaks the proverbial camel’s back, leaving them with no choice but to borrow a quick short term loan to cover the costs. The government have promised a new NS&I saving bond, but this won’t really help. JAM families don’t have the money to put aside into a savings account and probably will not want their cash locked up for three years. The benefits freeze that had left many families struggling to keep their heads above water has not been lifted. As families grow and expenses pile higher, these benefits are needed now more than ever. To Conclude: What does the Autumn Statement mean for JAM families? The Chancellor’s Autumn Statement did have some good news for the JAM families, but there were also many disappointments. Does the good outweigh the bad, or is a bleak future predicted? The overall consensus was that although the report did bring some positive tidings, not that much has been done towards bringing about effective change in the situation of families who are truly struggling with their finances. 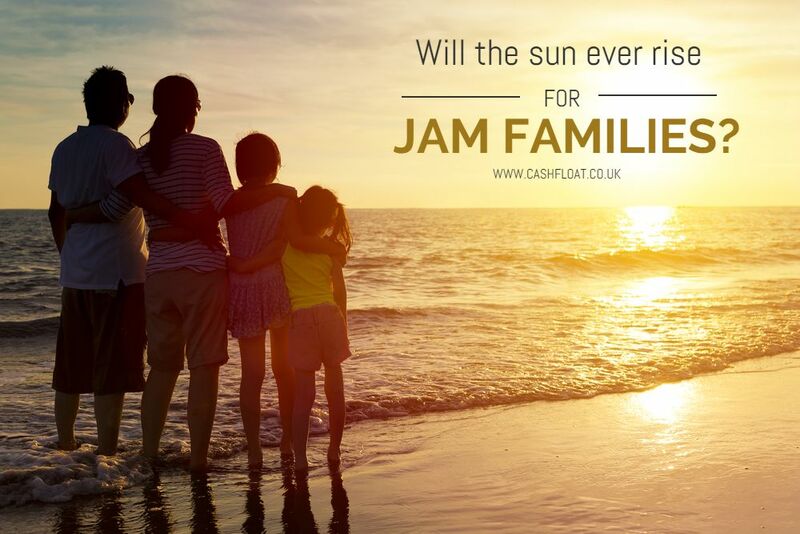 So, is it all doom and gloom for JAM families? Not quite. Some experts have commented that although there isn’t much good news for the moment, the changes that are being made now will have a positive impact in the long run. There is still a long way to go before the group of JAM families are financially secure, but we are on the way.